← Big bad hormone disruptors: think that the Toxic Substances Control Act protects us? Think again people, we are on our own here! I had the good fortune to attend an all day summit on Saturday entitled “Universal Responsibility and the Global Environment: an Environmental Summit”. 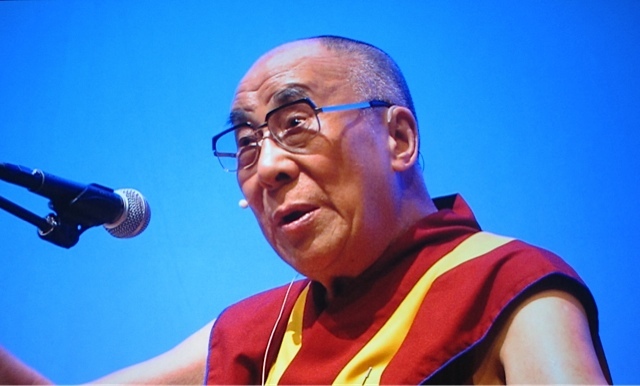 The original draw for me was that the Dalai Lama was going to speak throughout the day, someone whose message of compassion and tolerance is well known throughout the world. My expectations of the summit were greatly and quickly exceeded. The morning panel consisted of the Dalai Lama; our governor John Kitzhaber; the Executive Director of the Oregon Environmental Council: Andrea Durbin, David Suzuki: well-known scientist and environmentalist, and the moderator: David Miller, host of Think Out Loud( a daily radio show on our local NPR affiliate). The conversation was lively and focused on what we are facing as humans in terms of the environmental issues so prevalent throughout the world. Much has been written about the changes we are seeing in the earth’s climate and it is difficult sometimes to know how each of us CAN make a difference in our daily lives that WILL make a difference globally. Briefly, the panel highlighted the need to shift our measurement of success from the GDP(Gross National Product), which relies primarily on the movement and growth of the economy, to one that measures our happiness and how we interact with the environment and with others on a more sustainable manner. Over and over again, the conversation returned to the intricate relationship the human species has with nature and its cycles: it is only in the past 100 years or so that we have distanced ourselves from farming and become more focused on our JOBS and on the cities we have built. That distance sometimes allows us to forget that we depend on ‘nature’ to give us the air, water and food that we need to live. As David Suzuki so succinctly put it, “why has the environment become a political issue? all human beings need air and water to live: let’s start from that premise and work forward”. At Menopausibilities we have talked about taking the time to reflect, to eat organically, to pay attention to the chemicals that we are exposed to , to be aware of the many hormone disrupters that are so prevalent in the world around us. Yet each of makes decisions every day that affect the quality of our lives: we ‘vote’ with the choices we make: where we shop, what we buy, how far we drive to go to work, whether we carpool, whether we shop locally or always look for the bargain and neglect the wider impact of our choices. 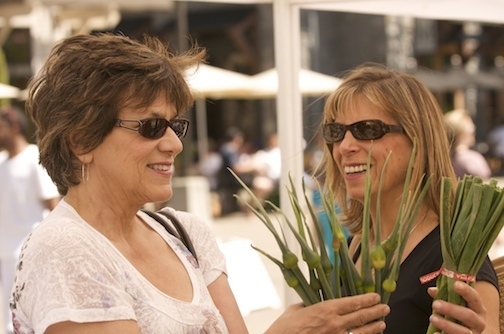 Candace and I at one of our favorite local farmers’ markets: always a source of inspiration! As for me, I do try to buy organically and shop locally whenever I can but of course there are times that I don’t. I love the idea of the 80/20 or 90/10 rule of living(or eating or what have you): 80 % of the time striving for the best practice, 20 % perhaps not reaching that high bar: but that is better than most and a step in the right direction! It became quite clear to me by the end of the summit that I have some changes to make, ones that are doable and will have an impact. First and foremost, I am going to compost again. I can’t believe that I ever stopped actually, having lived in Oregon for over 30 years…but laziness set in so now I get to start this practice again. I went and bought my silver compost bucket yesterday and I have already filled it to the top with scraps from all of the veggies and fruits that I have eaten….uh oh, now I must get my bin in place. That is my next step and I am determined to get this in place by week’s end. Then I will feel much better about creating a smaller carbon footprint plus some rich compost for my vegetable garden, which my husband and I just planted yesterday: more about that in a future post! For now, wishing you time to reflect on the choices that you make each day…and hope that we continue to believe that we CAN make a positive impact, even when we make seemingly small changes. As always, we would love to hear from you and some of the choices and changes you have made. Kyle, you rock and thank you for your help in my acclimating to the NW. I love this post. As a yoga teacher, I have learned that “community” is what is most important and try to shop locally as much as I can. I continue to be amazed at the way people interact here in the NW with compassion and kindness. I am glad that I found you to help me with my health.